Arsenal have received a quadruple boost on the injury front as four of their players have now resumed training with the first team. Per Mertesacker, Danny Welbeck, Aaron Ramsey and Chuba Akpom have all made comebacks ahead of our Boxing day fixture against West Bromwich Albion. 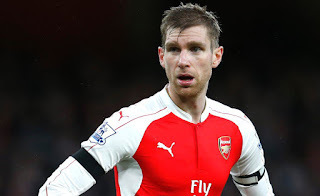 Mertesacker who has been out of action since pre-season has overcome his knee injury and is expected to return to competitive football in January. Danny Welbeck has been out for a longer time than Per, so he might have to wait a little longer before appearing on the field of play again. As for Ramsey, he has a chance of being listed in the squad to face Tony Pulis' side since his was just a short term hamstring problem. Another player who should start playing first team football again by January is the talented Chuba Akpom who has been struggling with a knee injury since September. Except for Ramsey, the West Brom game will be too early for the returning players but it's at least a nice feeling to know that they have totally overcome their fitness issues. What a boost Arsenal have gotten!